Autograph Collection Hotels and Hersha Hospitality Trust have opened Cadillac Hotel & Beach Club. 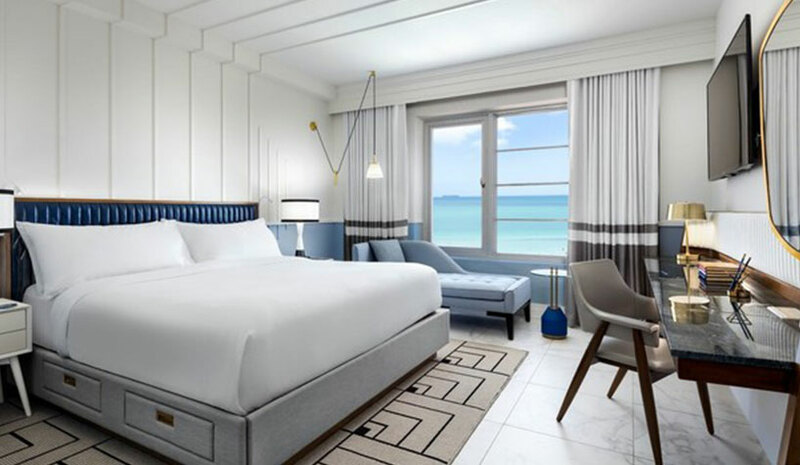 Located in the heart of Miami Beach at 39th St. and Collins Ave., this luxury hotel, recognized as one of Miami Beach’s original and historic Art Deco properties, has undergone a multimillion-dollar renovation. This is the fourth Autograph Collection hotel in Miami. New York-based interior design firm Bill Rooney Studio designed the newly renovated hotel, inspired by the 1940s Italian and French Rivieras with a preserved Art Deco aesthetic. Oceanfront and city-view rooms, including 20 suites, are complemented by white stone floors with Art Deco-inspired articulation, flattering ambient lighting and subtle gold and smoky blue accents. At the heart of the Cadillac, the lobby has kept its classic signatures with original terrazzo floors, lush greenery and a wraparound mezzanine balcony overlooking the check-in and lounge area. Egan Miami Beach, the hotel’s lifestyle boutique, is located at the hotel entrance. On-site restaurants and bars include Donna Mare Trattoria and Bungalow by the Sea. Several flexible indoor and outdoor meeting and event spaces include a high-tech and high-styled boardroom as well as a ballroom that fills with natural light from floor-to-ceiling windows and opens onto an expansive pool deck. The Luxury Collection has added Hotel Talisa in Vail, CO, its first ski destination resort in North America. With interior design by Leo A Daly, the hotel reflects Vail’s rich history and the spirit of Rocky Mountain adventure. Vail Hotel Partners LLC, a private real estate investment firm, has invested over $65 million in renovating and rebranding the hotel. Formerly known as the Vail Cascade Resort and Spa, the 285-room property will reposition as Vail’s newest luxury resort. Hotel Talisa remains under the management of Two Roads Hospitality. Beyond the refined alpine influences to the room decor, the resort’s accommodations acknowledge guests’ outdoor-centric activities with benches and gear storage as well as amenities ranging from soaking tubs for tired muscles to day beds to invite additional guests over to mingle after a day of skiing. The Luxury Collection’s Hotel Talisa offers three culinary venues: Gessner, the hotel’s full-service restaurant; The Fireside Lounge; and The Market. The property recently added The Spa at Hotel Talisa, and additional features include a new fitness center as well as the resort’s 58,000-sq.-ft. adjoining athletic club. Hotel Talisa also has more than 40,000 sq. ft. of meeting and event space. Solaz, a Luxury Collection Resort, Los Cabos, has opened in Mexico. Located midway between Cabo San Lucas and San José del Cabo, the 128-room beachfront property is The Luxury Collection‘s first hotel on the Baja California peninsula. Each guestroom and suite has a private entrance and patio, contemporary furnishings and original art. Further setting the mood, Bluetooth technology offers touchscreen remote control access to the curtains, lighting and music. Springing from the fertile imagination of renowned Mexican architectural firm Sordo Madaleno, the resort’s cascading terraces mix desert vegetation with quarry stone, granite, marble and wood. Celebrating the distinctive endemic landscape of Baja, Solaz Resort features a sustainable lush “dry jungle” featuring only endemic flora. The Luxury Collection’s Solaz Resort features original works throughout the property, all created by famed Mexican artist César López-Negrete, who traveled throughout Baja for years studying the region’s land, water, history and folklore. El Gabinete “Del Barco” is the resort’s indigenous gallery, showcasing rare regional artifacts such as a 43-ft.-long whale skeleton and a historical map collection. The hotel offers five restaurants and lounges, five swimming pools, state-of-the-art exercise facilities with Technogym equipment and group of personal fitness instruction, the 10,000-sq.-ft. Ojo de Liebre Spa and 20,000 sq. ft. of meeting, wedding and event space. Autograph Collection Hotels has opened Sofa Hotel Istanbul. The 82-room hotel is the collection’s first property in Turkey. Designed by renowned Turkish architect Hakan Kiran, the hotel’s interiors are tranquil and relaxing, offering a contrast to the city’s bustling streets. Sleek lines, custom-designed furniture, bespoke artwork and modern light fittings complete the 82 guestrooms, which are decorated in grey tones with splashes of deep red, mustard and copper throughout. Each guestroom offers a large marble bathroom with standing shower and separate bathtub. Located on the first floor, Sofie Restaurant is open 24/7, providing gourmet breakfast, lunch and dinner. Frankie Istanbul, a rooftop destination, offers unique fusion menu of Mediterranean dishes and local cuisine. Other hotel features include The Green Spa and a flexible area for bespoke events (up to 250 people can be accommodated in the largest space).